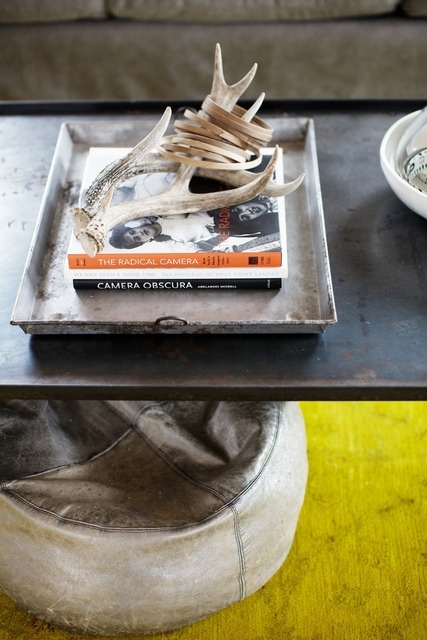 DIY- Overdyed Rug | Design Lines, Ltd. These instructions are great, thank you!! 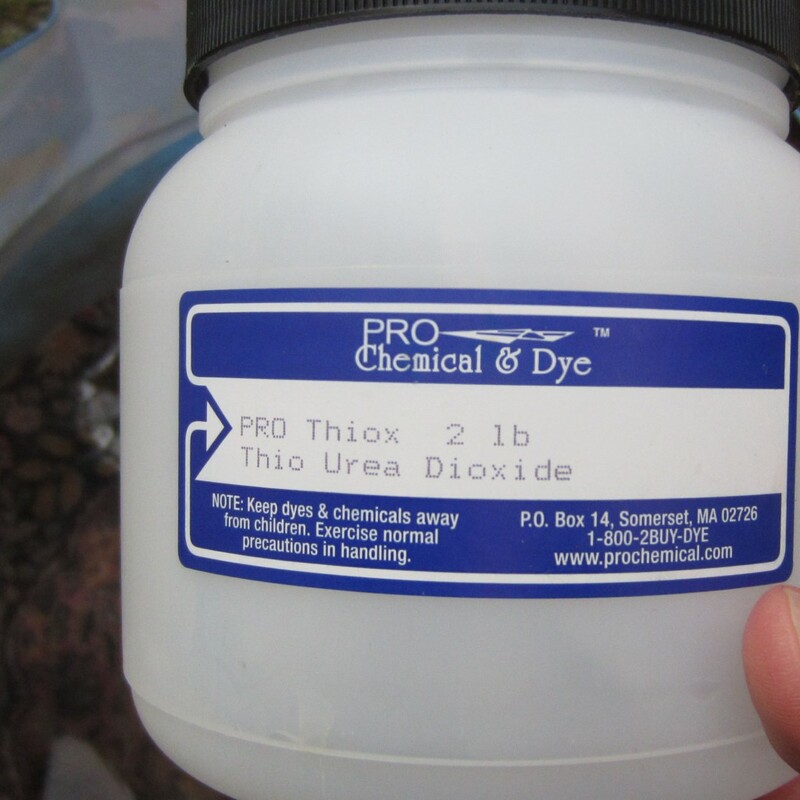 How should I dispose of the thiox/soda ash dye/citric acid water? I’m assuming that if I need a respirator to work with them, I shouldn’t just dump them in the backyard? Great Question Susan! 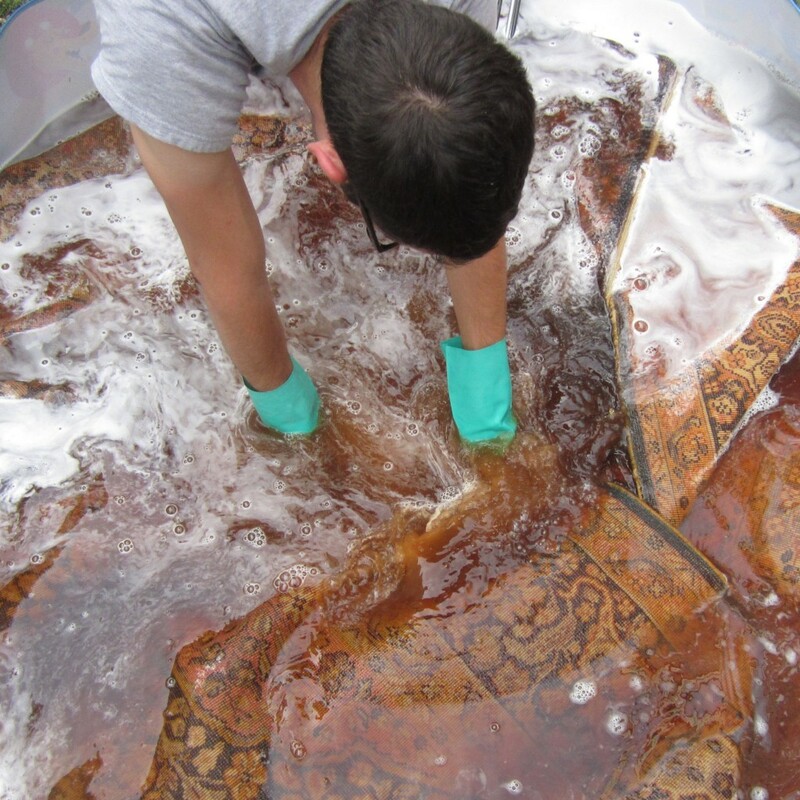 You should always use protective clothing, gloves, eye protection, and a respirator when dying your rug. For specific information about proper disposal of the chemicals, you can refer to the Material Safety Sheet for each product. This is by far the best tutorial I’ve found on overdying rugs and I’ve scoured the internet. Thank you! I have a narrow, long carpet. Is doing this is a bathtub a bad idea? Will it stain during the bleaching? I’m not sure how it would work in a bathtub, because I don’t have experience with doing it that way. I don’t think that the bleaching process will cause staining, because it has no color, but the dye may stain. 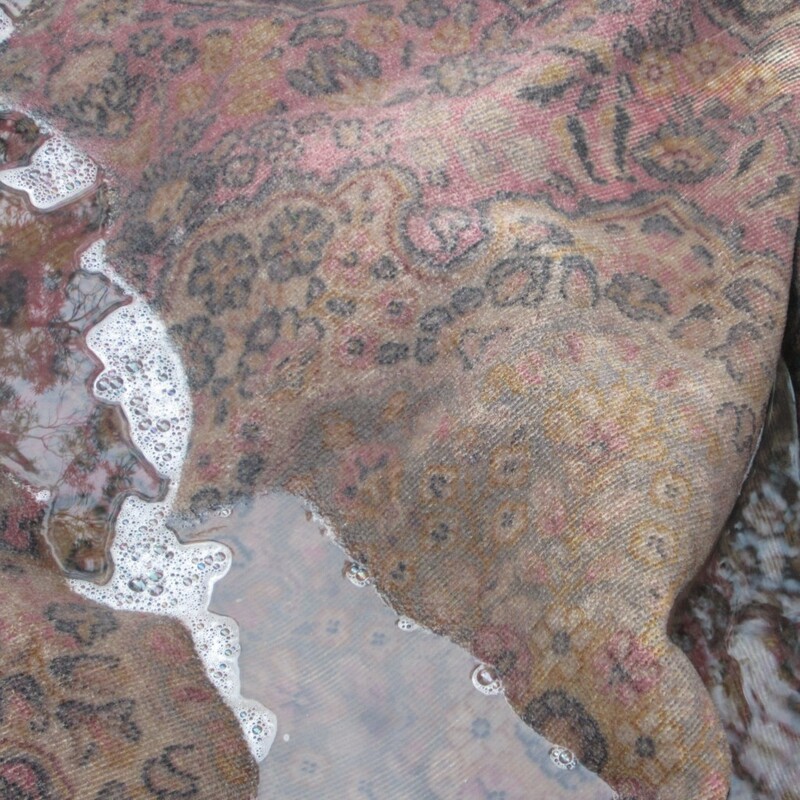 I read your directions for overdyed rugs with great interest as I’m considering doing one. If I do, it will be to get the bright red with dark red effect of many Afghan rugs. Since this is a darker effect, do you think it’s still necessary to bleach the rug? If so, would one soaking in bleach be enough? 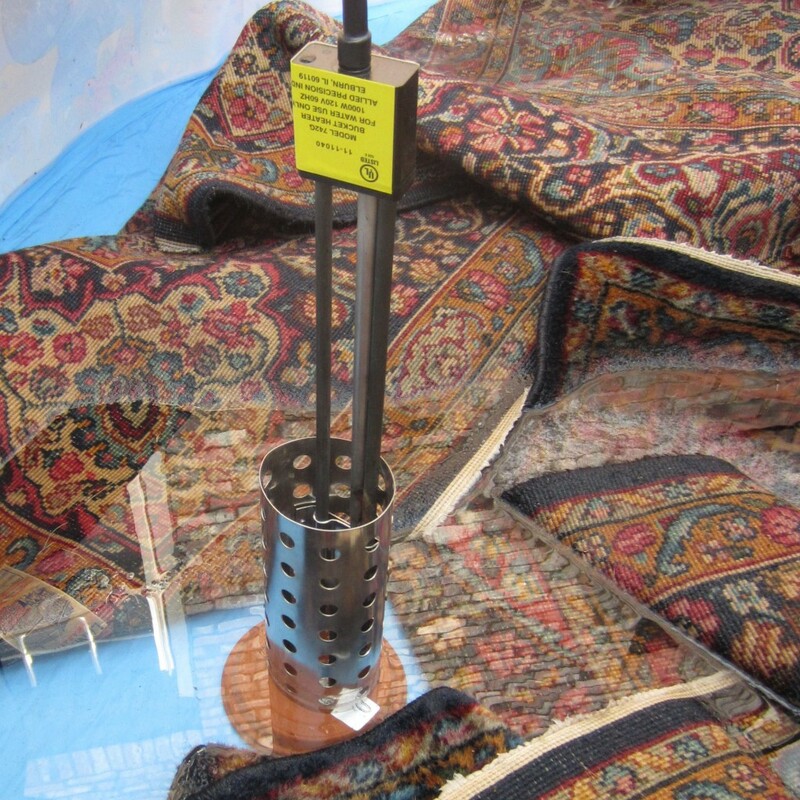 If I do this it will be because the Afghan Kazak rug I want to use to reupholster a fainting couch is too heavy to be workable. Any experience with doing this? 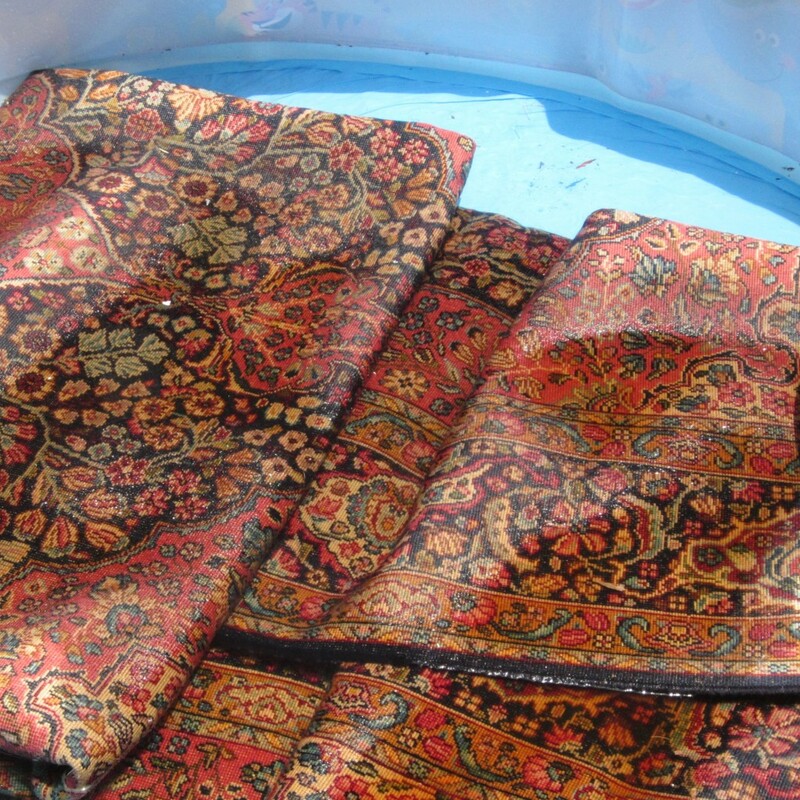 I have a sort of tapestry that has a rug pattern but is a lighter weight fabric though still with pile. I was going to use that but the maroon/navy/cream pattern looks blotchy on the couch compared to the more monochromatic though still patterned Afghan rug. By the way, I think the bright yellow rug you did is pretty sharp. Even though you’re working with a dark color, I would still recommend bleaching the rug before you dye it. 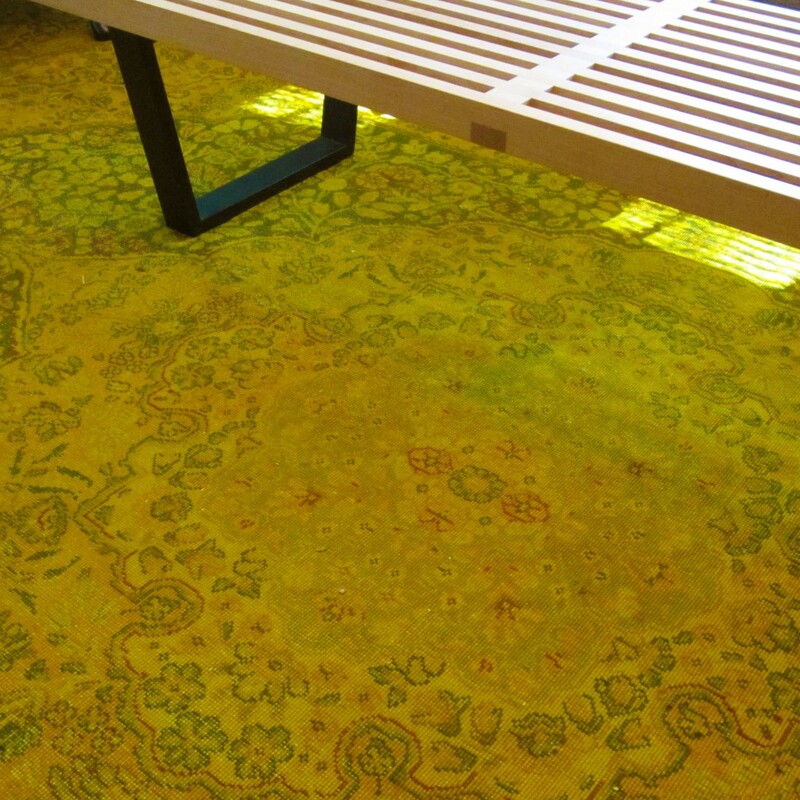 That is the only way to get the vibrant, saturated hues that make overdyed rugs so appealing. One soaking in the bleach solution should be enough, provided you use the right amount for the weight of fiber. Follow the link to Dharma trading company, where you can find the amounts of Thiox and other chemicals you’ll need to buy based on the weight of your rug. Remember, the bleach solution is not chlorine bleach, but is made of Thiox, a chemical that bleaches wool. 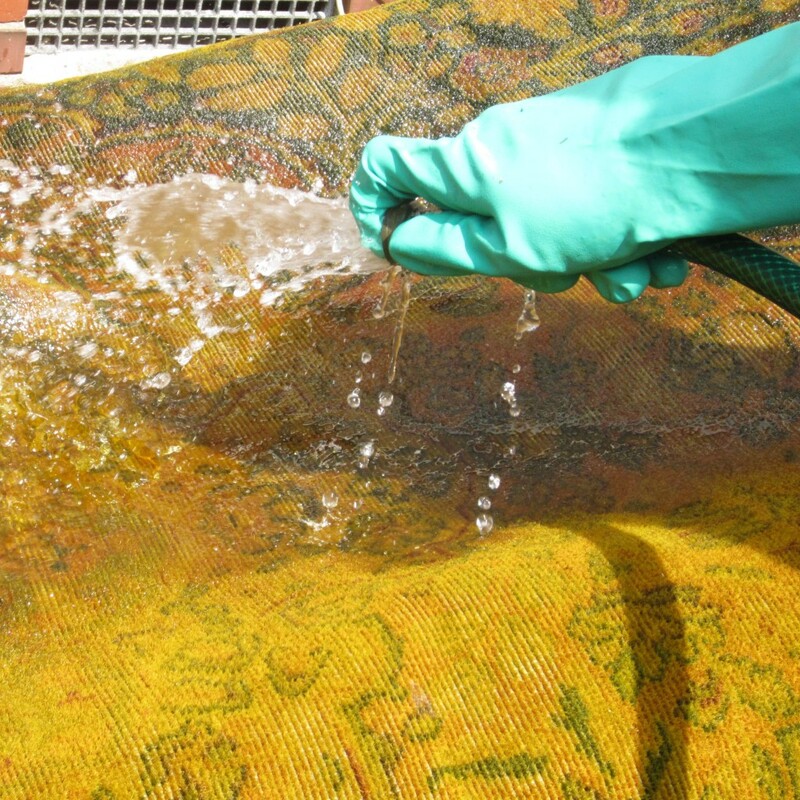 Regular Chlorine bleach will not work, and will damage your rug. If you decide not to bleach your rug before dying, you’ll still have to wash it thoroughly to make sure the dye will stick. 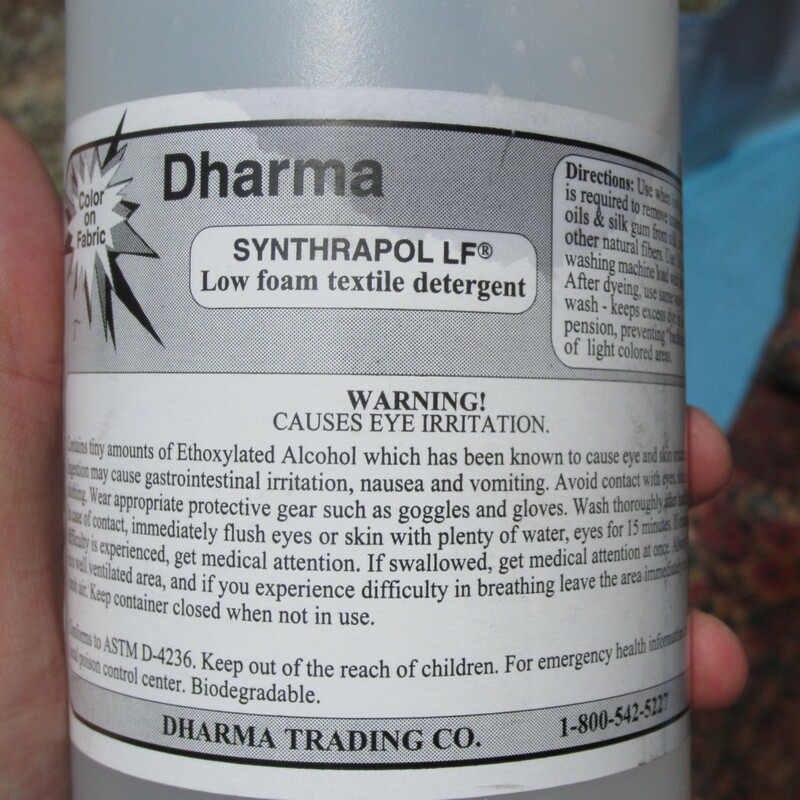 Use a low foaming detergent as recommended in my blog post (also available from Dharma). Good luck with your project! Let us know how it turns out! Don’t know if the disposal question got dodged intentionally or not, so thought I’d second the question. You said you used a collapsible pool for your big rug. How did you drain or syphon the various baths out of there each time? and, into what? I am dying to try this, and your instructions are helpful. I just can’t wrap my mind around how to deal with the volumes of possibly toxic liquid while it gets from point A to point B, not to mention the heavy, wet rug. (the one I want to do is 8 x 10.) Thanks in advance! I was wondering how much Thiox and Soda Ash you used? I want to do this on a similar rug that is an 8’x10′, but don’t know how much it weighs. 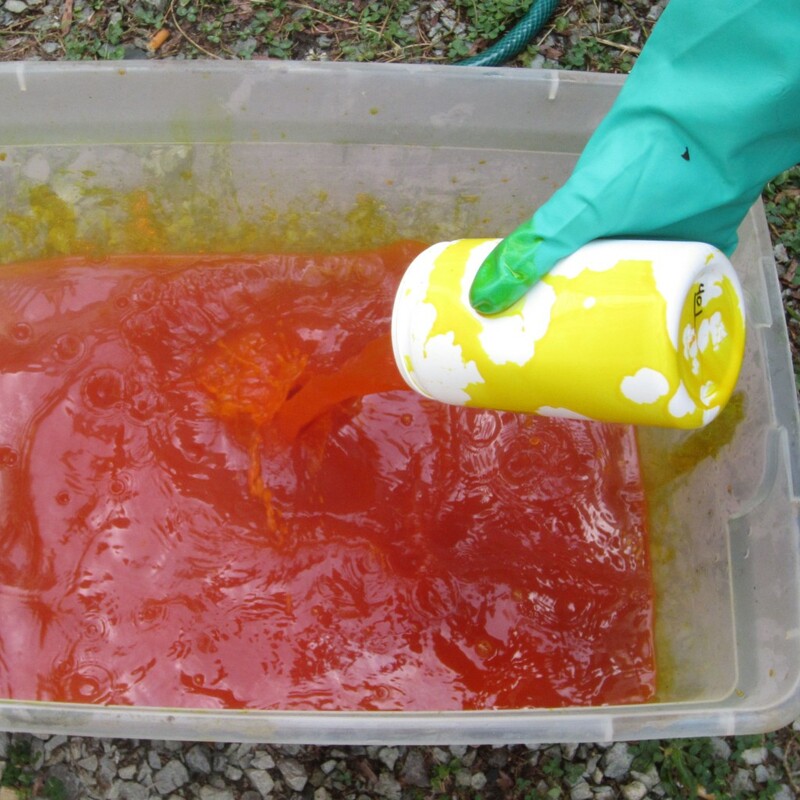 Same with how much dye and citric acid? Thanks! 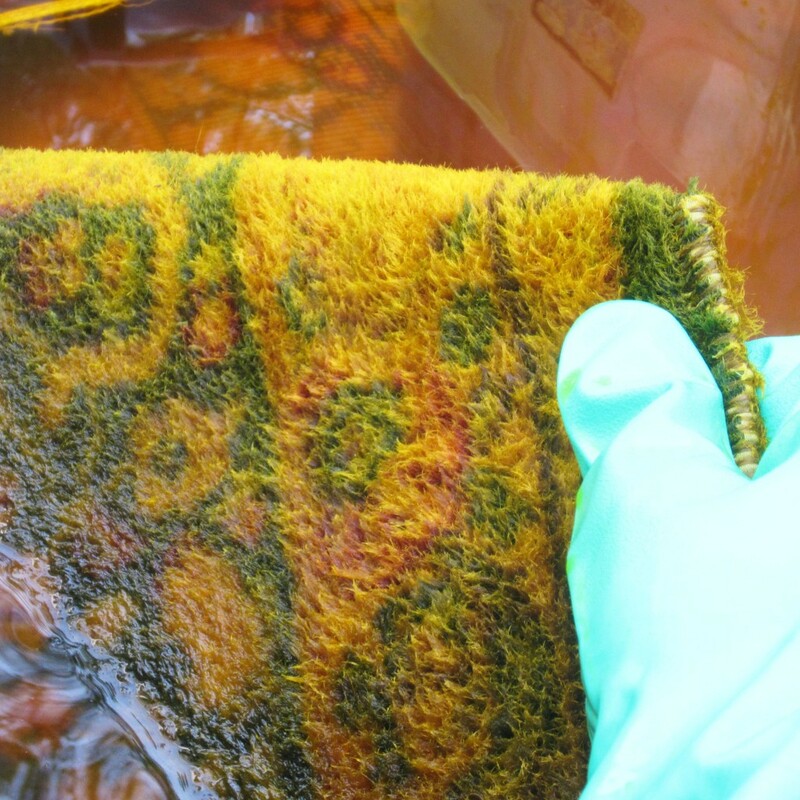 Great tips indeed, i think this process of dye is quite difficult…but your explanation is must better. Hello! 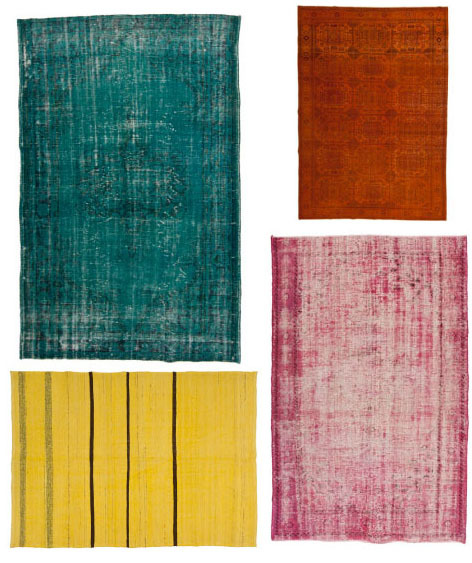 I just purchased a rug with the intent of having it overdyed / or doing it myself. I too am in Raleigh and was wondering if you knew of anyone local that is doing this – or if it is still a DIY job… I’m good at projects but I’m not sure I’m THAT good! I’m not sure if there’s anyone who does this kind of thing locally, but you may have some luck contacting Nomadic Trading Company in Durham. They have a large selection of overdyed rug and they may have information for you. Are the steps the same for a white one ? Hi Robert, what a great tutorial. I bought a huge rug online and I think its great to use because its also a little bit worn out so I get a good vintage look. However, it smells horrible. Really horrible. Like something died in there. Anyway I can return the rug but I do like the design a lot. So I was wondering if the smell will come out during the process of bleaching. What do you think? I know this is an old post but I’m hoping I’ll still get a response. I was wondering what exact amounts of the products you used as I am currently trying to purchase the stuff to over dye a similar sized rug. Thanks!